Today I'm (finally) finishing out my reviews for WWE Legends series 3 with the last figure, Brian Pillman. I wasn't a fan of Pillman during his brief time in the WWE in mid-to-late nineties, but his contribution to the industry left a lasting impression on fans and Superstars alike. Like his fellow Hart Foundation member, Davey Boy Smith, Brian Pillman belongs to that group of entertainers that were lost way before their time. I wasn't crazy about how the British Bulldog's figure turned out, let's see if Pillman's faired any better. 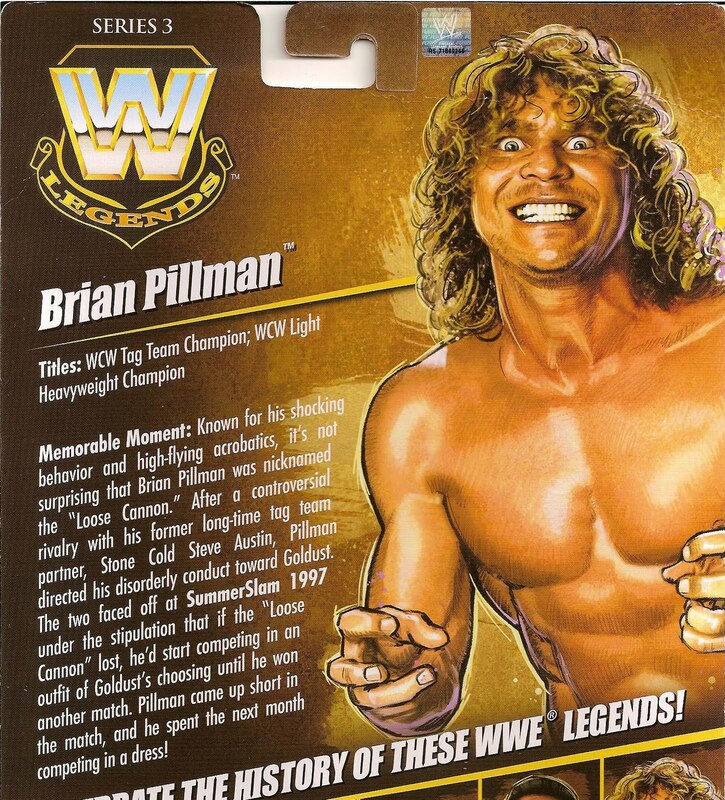 Okay, face sculpt matches Pillman's expression on the card art? Me like! I think they did a decent job of capturing BP's likeness, but the lack of any paintwash really hurts the sculpt because the tiny details get lost in the monotone plastic. Sure, they added a light spray of paint for his facial hair, but a darker wash across the face would have added the depth needed to make it really look like Pillman. It's a shame they didn't take a little more time with the facial details. I'm not entirely surprised as Mattel foregoes any paintwashes on the flesh in this line. It doesn't hurt other figures as much as it does Pillman. I also find his height to be inaccurate. He should be much closer to Ricky "The Dragon" Steamboat in stature and even though it appears as they share the same lower body, Pillman's lower leg pieces (between the knees & boots) is longer, making him taller than he should be. The paintwork on his body is minimal with white paint used for his wristape, red used for the patch on his inner thigh/crotch areas and silver and red used for the tampographed symbols on each of his thighs. The symbols are well-applied and feature small silver dots on the inside of the red outline. They didn't paint the peg holding the knee in place, so it's looks like the symbol is cut off at the corner. It's a small detail, but one I they can and have fixed on other figures. 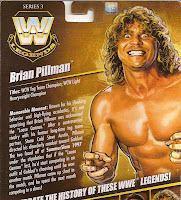 Pillman is part of the last wave of Legends figures to still include the cardboard name tag and WWE logo display stand. His only true accessory is his entrance vest. Unlike the molded plastic vest on Stone Cold Steve Austin or the faux-leather one packaged with the British Bulldog, Pillman's vest is more of a vinyl-type material, much like what we saw on "Defining Moments" HBK. It's very thin, but is nicely detailed with a studded look achieved by the white paint. Overall all I'd call this Brian Pillman a decent figure. At the original $15 price point, he's mainly for fans of the Superstar. I bought him for $12.99 at Toys R Us and he qualified for the Vince McMahon mail-away promotion a couple of months back. Not a bad deal overall, it's just a shame a little more detail wasn't added to his face to make him look really good. Also, the fact he only really includes one accessory makes you wish they'd tossed SOMETHING else in. A pair of crutches, maybe? Very soon the days of finding discounted WWE Legends (at least future releases) at stores will be gone as the line is heading to MattyCollector.com starting in 2012 and then we'll be at the mercy of Mattel and the horrible webstore they utilize for their "Adult Collector" lines. I don't think there has been any word on pricing for those figures, although The Rockers two-pack (which is available today) is priced at $30, leading me to believe the single figures will be $15 each. So don't pass up on discounted figures if you find them!